Framed photos complete a home and make it feel more welcoming. Whether you are moving into a new space and looking to make it yours or just ready to revamp you current home, framed photos are your solution. The beauty of framed photos is that you can personalize them to your style. Do you like a rustic farmhouse feel? Try using natural wooden frames. Would you rather have a sleek modern look? Frame your print with a classic black frame and white matte. Choosing a frame style is the first step, next you need to make sure the picture will fit. We’ve created a guide of picture frame sizes to help you pick the correct size frame. Simply keep in mind what size your photos are and match them to the correct picture frame sizes. There are a few sizes that are the most common when it comes to photo prints. When you are designing a wall, you are most likely working with these sizes. Working with popular print sizes makes it easier to find the correct frame in the style you want. 4×6 photos are the standard photo size and the most common for 35mm photography. 4×6 photos are good for a range of subjects, from family photos to abstract art. This size is also what most photo albums use. 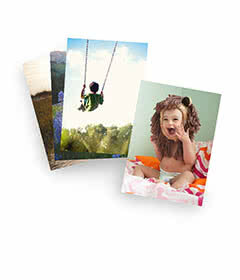 If your photo is 4×6 you will need a frame that is a little larger. How much larger depends on how much matting you want to include. The next size up from 4×6 is a 5×7 photo print. This size is preferred if your photo has a person as the focus. It’s a little larger so they will stand out clearer. 5×7 prints can fit in various frames, depending on how thick of matting you would like to include. 8×10 photos are larger than 4×6 and 5×7 so they are typically used for group photos or portraits. If you are hanging graduation photos in the hall, this is most likely the size you would use. There are a variety of sized frames you can fit a 8×10 photo in, depending on if you prefer a wide or narrow look. If you are working with a large wall as your canvas, you might consider creating a gallery wall to create visual interest. To do this try using one big photo from the common sizes below and then fill in the space around it with the smaller picture frame sizes. 16×20 sized prints are considered small posters. If you are using a photo this size, make sure the resolution is excellent. This will ensure the photo doesn’t appear pixelated or blurry. With a frame, the 20×30 print size is nearing the average poster size of 24×36. This size print is sure to be the center of attention in your space. Pick something big and impactful to frame, like a landscape or photo of the ocean. A 22×32 photo is larger than a poster, which means it doesn’t necessarily need matting.Try using a frame that is the same size as the print instead to keep it to a manageable size. When trying to find the perfect frame, first consider the space you have to work with. If you are redesigning the space above a desk you will have different parameters to work with compared to a living room wall. For a confined space you need to decide if you want to include many small photos or a few larger ones. Consider the type of photo you are planning to hang in the space. A family photo is typically printed in a larger size to showcase everyone’s smiles, so it will probably need a thin and simple frame. On the other hand, a simple scene with only one focus can be placed in a thicker, more intricate frame. Matting will affect the frame size you decide on. There are also many different colors and textures you can choose from. A smaller photo with a thick matting will need a bigger frame. Make sure to take into account how much matting you want to show when choosing a frame. If you are going to a store to pick out your frame, bring the print or a copy of it with you. If it is a poster size you can just take a photo of it and take that along. Holding the photo up next to the frame will help you decide on which frame style you like best. Before you leave the house, measure the space you are planning to hang the photo. Measure the matting that you want to frame the photo in. Lastly, measure the frames in the store to make sure they will fit in your home and that the matting will fit properly. When looking for the perfect picture frame sizes it’s easy to get confused by measurement. Sometimes the sizes are stated on the frame, but often times we are left to figure it out on our own. Choosing the right sized frame makes all the difference, and with this guide you’ll have your photos hung in the correct sized frame in no time.